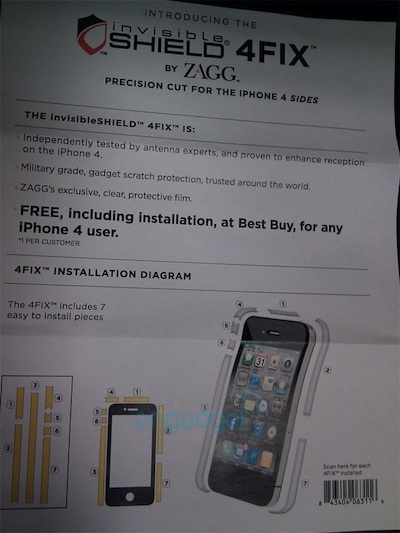 Engadget reports that Best Buy is apparently giving away free kits of antenna-shielding strips, known as "invisibleSHIELD 4FIX" from ZAGG, to any iPhone 4 user interested in receiving the product. The offer also includes installation of the seven "invisible" adhesive strips included in the kit that cover only the surface of the stainless steel band around the edge of the iPhone 4 that serves as the device's antennas. Based on a number of tips that we've received, we're getting the impression that the yellow-tagged retailer could be handing out (and installing) completely free side coverings for any iPhone 4 owner that waltzes into a store, presumably as a proactive measure to fend off returns or to upsell consumers on an entire invisibleSHIELD / separate case. The invisibleSHIELD 4FIX kit is normally priced at $9.99, and Best Buy's offer provides an alternative to Apple's free iPhone 4 bumper and case program, one that will allow users to receive the benefits of the antenna fix while retaining the appearance of a "naked" iPhone. ...At least it's not the 4SKIN.